According to Rudolf Steiner, the future Maitreya Buddha - or the 'Bringer of Good', as his predecessor named him - incarnated in a human body in the twentieth century. Presuming this to be so, then who was this person? The Theosophists believed they had discovered the Bodhisattva in an Indian boy, Krishnamurti, who grew up to be a teacher of some magnitude. 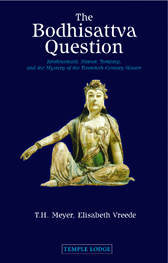 Adolf Arenson and Elisabeth Vreede, both students of Rudolf Steiner, made independent examinations of this question in relation to Steiner's personal mission, and were led to contrasting conclusions. More recently a claim has been made that Valentin Tomberg - a student of anthroposophy but later an influential Roman Catholic - was the Bodhisattva. These conflicting theories are analysed by Thomas Meyer, who demonstrates how the question can be useful as an exercise in developing sound judgement in spiritual matters. Elisabeth Vreede's two lectures on the subject, included here in full, are a valuable contribution to our understanding of the true nature and being of Rudolf Steiner.